Abdul Abdullah, Abdul-Rahman Abdullah, Khaled Sabsabi. Rusaila Bazlamit, Cigdem Aydemir, Eugenia Flynn, Abdullah MI Syed and Idil Abdullahi. In July 2017 We Are all Affected began its life at the annual Multicultural Eid Festival located in the Western Sydney suburb of Fairfield, where the seven Australian Muslim artists presented their work to the wider community for the first time. 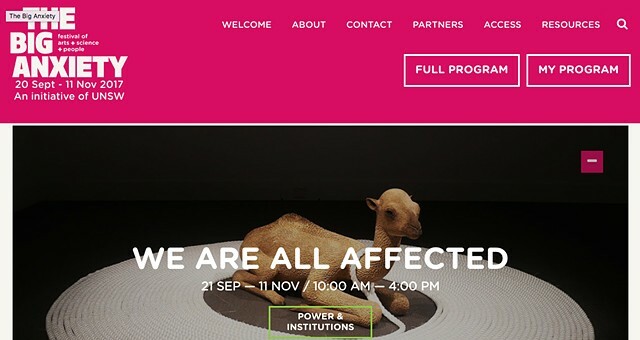 Invited by The Big Anxiety to develop a program that extended community engagement, curators Khaled Sabsabi and Nur Shkembi proposed that exhibiting in a festival beyond the artworld would present a unique test of art’s capacity to build connection. The final evolution of the project, in gallery spaces in Auburn and Fairfield, reveals how the artists’ works were changed by Multicultural Eid Festival experience, and extends wider community engagement through a series of workshops. Amidst photography, video installation, sculpture, ceramics and interactive media, a series of workshops will be staged, challenging and promoting reflection on the often negatively framed public conversations about Australian Muslims.